In this day and age it would be safe to assume that there are more law firms in the United States than there are McDonalds restaurants. Despite this surplus of attorneys, the job of seeking out the right attorney (and the best attorney) for you is no easy task. Adding to this complication is the fact that many large firms have become burdened with substantial overhead, billable hour requirements, and utilize associate level attorneys with little experience (who are skilled at providing mediocre work product). Conversely, many small firms and/or sole practitioners who might provide more affordable legal representation often lack the required expertise or find themselves practicing in areas which they are not qualified. So how does one find the right attorney for them and their legal matter? At Chioini Group we believe we know the answer to this question, as do our counterparts in the legal industry. This is why our office is routinely engaged by other attorneys (and legal professionals) to protect the interests of their friends and family when it is needed most. We are proud of this distinction, and believe there is a very simple reason we are able to maintain our high legal integrity amongst our peers and our clients. It is because of our dedication to our methodology and our core principles. We believe it is these ideals in our profession that are frequently overlooked by the consumer, however, remain essential to other attorneys when referring cases. Understand: We believe one of the most important times in any legal matter is during the initial meeting with the client. It is at this time when we learn about our client on a personal level and get to know and understand the issues surrounding their legal matter. At the same time this is when we answer questions and have open and candid discussions with our clients. It is very important that we understand our client’s objectives and goals and assist them in formulating a distinct and unique legal roadmap for their case, as no two clients are the same and law is not a template. By spending time and establishing these things in advance, it leads to a more fulfilling, trusting, and long lasting attorney-client relationship. Plus, it lends to a more successful case, which is our ultimate goal. Preparation: This principal cannot be overstated. Great attorneys know that there is no substitute for preparation. We strive to not only prepare ourselves, but to prepare the client for the legal matter ahead. Part of good preparation includes extensive review of information that has been supplied to us by our clients and continually supplementing it as the case moves forward. At Chioini Group papers are reviewed as they are received and are immediately catalogued into client trial binders to be used at a later time. Our trial binders and exhibits are prepared as we go, not on the eve before the trial. We believe that this not only saves our client’s money, but it assures that we know our case on an intimate level and are ready to go when the time comes. This is not standard or ordinary practice in this industry and more often than not attorneys spend precious time pre-trial getting organized or seeing things for the first time. We make sure to avoid that scenario at all costs. Be an Expert: At Chioini Group we believe it is implicit that all attorneys should make themselves experts in the area of law surrounding any case they are working on. What is frequently overlooked, however, is that the attorney should also make themselves experts as to the facts and intricate details within the case. Many attorneys rely on their client or third parties to impart knowledge into the case, however, at Chioini group we believe it is essential that we understand our case better than anyone else in the Court Room. Part of being an expert in a case is finding the answers to difficult questions and not settling until that answer is found. Sometimes this includes drawing on a number of people or companies in our professional network to assist us in developing a better understanding for the intricacies of our case. 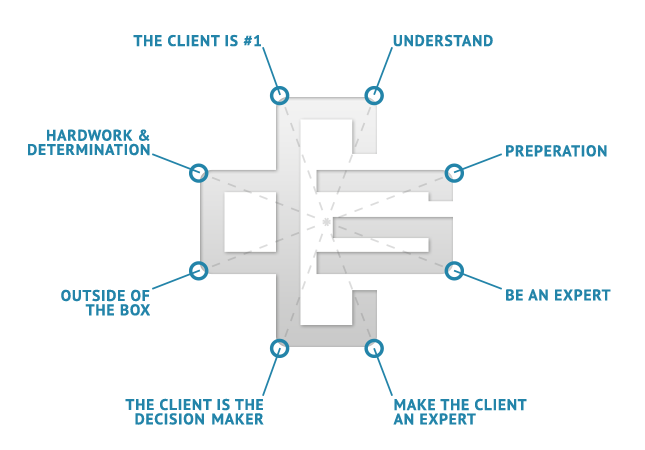 Make Your Client an Expert: One of our most important characteristics of excellent representation is the ability to make your client an expert in their case as well. There is no better ally to an attorney in court than a well prepared client. For complex matters clients are provided their own trial binders and exhibits in advance of the trial. Client as Decision-Maker: The most common problem that arises between clients and attorneys is when attorneys fail to keep their client informed on their case. Unlike most firms, at Chioini Group we go to great lengths to make sure the client remains informed of all matters and in a reasonable amount of time. Most attorneys and firms save time and hassle by simply supplying client information in passing or in bits and pieces as it is convenient to them. We strive to not only copy clients on all correspondence or information that comes in or goes out, but also provide explanation when needed. This allows the client to stay up to date on the progress of the case, but more importantly it allows the client to be the decision-maker. Outside of the Box: We believe that all legal matters have an exponential amount of resolutions, however, this may frequently be overlooked for lack of experience or time. In fact, in our experience many attorneys tend to shy away from anything other than boilerplate or template resolutions. Although there may be a myriad of other possible solutions that could be mutually beneficial for all parties due to a lack or want to understand these solutions. Nonetheless, we believe it is our ability to engage in creative thinking in all matters and it has greatly benefitted many of our past clients. Hard Work and Determination: The practice of law is a thankless profession. It will never be a 9 to 5 job and most attorneys would be remised if they did not acknowledge that hard work and determination is one of the most important factors in all cases. There is simply no substitute for hard work and there comes great advantage to a client from an attorney who understands and lives this. Client is #1: All clients are of equal importance and not one legal matter is more important than any other. We strive to treat all of our clients equal and to build long-standing and valuable relationships and friendships.